Many tributes have appeared in the short time since his death, and the writer is certainly worthy of serious consideration. It would be preferable, however, if the commentary were somewhat more thoughtful and sober. Repeated claims along the lines that Updike was “the greatest novelist writing in English,” “one of the greatest American novelists of the 20th century,” “our time’s greatest man of letters” and so forth tend to obscure the man and his work rather than shed much light. What makes a “great novelist”? However, a great writer must also have, in some fashion or other, “great” things to say. Not necessarily in the form of a single major theme or subject, but some sharper, distinctive insight, even if only partially conscious, into his or her times and contemporaries. 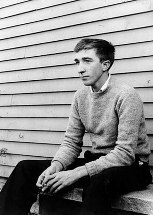 Of course, Updike paid attention to social and political development in America, and, particularly later in his career, commented on various aspects of modern life: changes in values, the “sexual revolution,” the radicalism of the 1960s, feminism, the cultural wasteland that much of America had become and so forth. But his purchase on these and other developments remained narrow, shaped by his upbringing and the intellectual framework established in postwar America. He described himself in 1988 as “a product of nearly forty years of the Cold War.” And an all-too uncritical product, in my opinion, who accepted at face value many of the self-serving arguments of the US establishment, including “the idea that communism represented a threat to American democracy, the sense that Americans were competing with a dangerous superpower for global supremacy…[the notion] that the communist system is antithetical to the basic right of individual freedom,” as D. Quentin Miller suggests in John Updike and the Cold War: Drawing the Iron Curtain. While Updike rummaged widely and provocatively through American life, finding much to dislike or criticize, his vision of things rarely went beyond those circumscribed limits. As the article below suggests, Updike came of age during a period of cultural regression in the US, at the height of the anti-communist purges, which made a left-wing critique of American life far more inaccessible. His own small-town, Protestant, lower middle class, rather smug background (for which Miller claims he always maintained “a painful longing”) and psychological predisposition made him vulnerable to the prevailing orthodoxies. The need to bend the truth, avoid certain realities, above all, not look too probingly at America’s social foundations affected his art, deflecting it and blunting it. In the more than 20 novels, there is far too much waste, secondary material, running in place, even showing off. As well, frankly, there is a good deal of mean-spiritedness directed toward those who fall outside of or reject Updike’s limited middle-class American universe. That being said, it is a mistake on the part of anyone who wants to know something about American life and the American psyche in the last 50 years to avoid John Updike’s work. He is generally interesting, often very amusing and sometimes insightful. His best writing was probably invested in the Rabbit Angstrom series, as noted below, especially Rabbit Run (1960) and Rabbit at Rest (1990). The Centaur is also recommended.